Today in 1648, Boston shoemakers and "coopers" (barrel-makers) formed what are considered the first American trade unions. 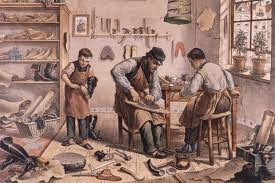 The colonies had till then failed to import the English tradition of guilds, whereby craftsmen would band together to establish prices, quality standards, apprentice programs and charitable programs. The guilds in England also supported members who had retired or were beset by health or other challenges. But these two 1648 quasi-guilds were limited to ensuring quality. The Massachusetts General Court prohibited "The Company of Shoomakers" from offering educational or charitable programs, or from fixing prices or settling disputes. More than a century later, the independence shown by the Boston shoemakers surfaced, as one of them has been credited with starting the Boston Tea Party. The Philadelphia carpenter's union, formed some years after 1648, was more aggressive on behalf of its workers, and its printers and shoemakers were also aggressive at an early stage in the city's history. According to the History of Trade Unionism in the United States by Perlman and Selig: “The earliest recorded genuine labor strike in America, in 1786, was over wages paid to Philadelphia printers, who ‘turned out’ to demand a minimum wage of $6 per week." The second strike on record, in 1791, was also in Philadelphia, by house carpenters who struck for a ten-hour day. 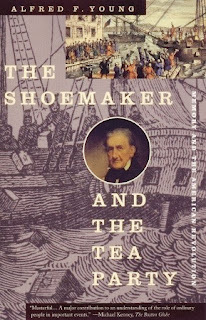 In 1796 local shoemakers in Philadelphia organized the Federal Society of Journeymen Cordwainers (shoemakers working with Cordovan leather). Three years later the organization staged a 10-week, successful strike for higher wages, the first strike in the newcounry sanctioned by a union. BLOG VIEWS | Just Passed 60K - Thanks! BOARD OF ELECTIONS | What's the Matter?